Leasing Available from $12.77 per month! Leasing Available from $17.10 per month! With an expansive feature set and remarkable durability, the Epson FX-2190 offers the flexibility required for critical daily print requirements. Powerful yet easy to use, this 9-pin, wide-carriage workhorse boasts an MTBF rating of 20,000 power-on-hours (POH) and speeds of up to 680 cps. 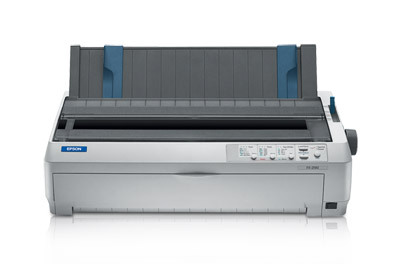 An extremely reliable, high-value performer, the Epson FX-2190 provides Parallel, USB, and additional connectivity options for seamless integration. And, it includes Epson Remote Configuration Manager software for easy printer setup and simple setting selections via most Windows operating systems. Ideal for rugged environments, this robust printer is the perfect drop-in replacement for the Epson FX-1180 / 1180+ / 2180 or the Okidata Microline 321 / 321 Turbo. The high-speed Epson FX-2190 races through forms up to 7 parts thick and 16.5" wide through four convenient paper paths. Its easy-to-install 12 million character ribbon cartridge boosts productivity and ensures a low cost per page, while its 400 million character print head life offers added dependability. Complete with a newly designed control panel featuring a lock-out mode and other intuitive functions, this versatile product is the ideal solution for demanding print environments. And, as part of a comprehensive three-year warranty, it's backed by superior technical support from the world leader in impact printing. Print Direction: Bidirectional logic seeking for text and graphics printing. Unidirectional text or graphics printing can be selected using software commands. Forms: Continuous multipart, original plus 5 carbonless copies, 1 + 6 copies with pull tractor, maximum thickness .018"
Single sheets: 3.9" to 16.5"
Cut-sheet feeder: 7.2" to 16.5"
Labels: Minimum: 2.5" x 0.94"